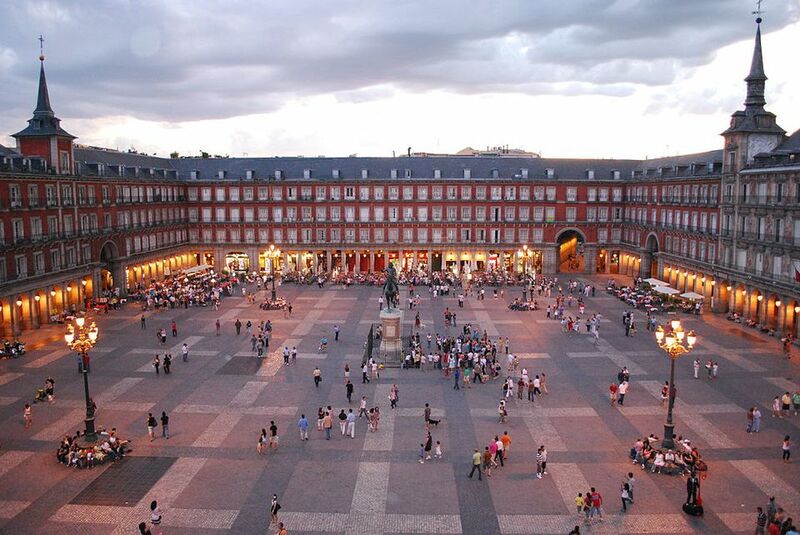 Madrid's most decorated plaza, with a number of restaurants, cafes and shops around its perimeter. A little to the west of Puerta del Sol. Tempted by one of the restaurants in Plaza Mayor? Most of them are overpriced and of mediocre quality. But if you really must take in the plaza atmosphere with a bite to eat, go for breakfast instead. They can't mess up coffee, orange juice and toast or pastry - and at about six euros, though the price is still a little inflated, it won't break the bank. There is a coin and stamp market on Sunday mornings. Read more about Madrid Flea Markets. El Botin can be found at Calle Cutilleros 17, a short walk from Plaza Mayor. Metro: Opera, Sol or La Latina. As one might expect, the menu is a little pricey, though by no means as expensive as it could be considering the restaurant's credentials (as an example, soup is 8 euros). The 'menu del dia' is a bit of a disappointment as it doesn't really provide you with much of a saving. So I recommend the Botin Experience, which is only slightly more expensive than the menu del dia, but includes a guided tour of the restaurant and a more extensive selection of dishes to try. Madrid's cathedral, more properly called Almudena Cathedral, is the city's premier church. The Almudena cathedral is on Calle Bailen, between the opera house and Plaza España. Despite Madrid being the capital of Spain since the 16th century, the city did not get its cathedral until 1993. The cathedral is open 10am to 7.30pm. Mass is scheduled for 7pm daily, as well as at 10.30am and 12noon on Sundays. Confession is held in Spanish, English, German and Italian, from 11.30am to 12:45pm and from 5pm to 7pm. Admire the royal palace with a beer or coffee in this attractive plaza. Between the royal palace and the opera house. Metro: Opera or Plaza de España. The cafes here are expensive for Madrid but you get what you pay for - good service in an excellent setting. What is Madrid Royal Palace? The official residence of the Spanish royal family. Where is Madrid Royal Palace? A little to the west of the opera house and a bit south of Plaza España. Many of the rooms are open to the public, decorated in original artifacts from times gone by. Art by such Spanish staples as Velazquez and Goya are on display in the palace. The cost of entry to the Royal Palace depends on which part you'd like to visit, with prices ranging from 2€ to 11€. Free entry on Wednesdays. Oct - Mar 9.30am - 5pm, (Sundays only until 2pm). Apr- Sep 9am - 6pm (Sundays 9.30am to 3pm). What is El Flamenco Vive? An excellent flamenco shop with very knowledgeable staff. Get their recommendations on which flamenco CDs you should check out. They also have books to allow you to study the art. Where is El Flamenco Vive? On C/ Conde De Lemos 7, a couple of minutes' walk from the royal palace. Useful Information about El Flamenco Vive? Nearby there is a number of guitar shops so you can also buy your instrument. What is San Gines Chocolateria? The best place to have Spain's most famous breakfast - chocolate con churros. Where is San Gines Chocolateria? On C/ Pasadizo De San Ginés, a small alley leading from Calle de Arenal to Calle Mayor. From Arenal, turn when you see the San Gines church. Useful Information About San Gines Chocolateria? One portion of chocolate con churros is usually enough for two people. There's no law that says you have to take your churros with Spain's quite sickly chocolate. Many go for coffee instead. What is Casa da las Torrijas? A bit of an oddity this one. This place looks like a classic cafeteria from days gone by, only they don't serve coffee! As the name suggests, this place specializes in torrijas, a sweet bread-based dish usually associated with breakfast in Easter. Here they drink it with a sweet wine from Malaga. Where is Casa da las Torrijas? On Calle Paz, one of the streets that leads directly south from Puerta del Sol. What is La Muralla Arabe? Remnants of a ninth century wall built by the Muslims who ruled Spain at the time. Where is La Muralla Arabe? Starts at Calle Bailen, next to the cathedral. What is Hammam Al Andalus? Turkish baths and tearoom in the heart of Madrid. It used to be called Medina Mayrit. You can book a session at the Hammam online here: Hammam Visit in Madrid Booking. Where is Hammam Al Andalus? At Calle Atocha 14, a short walk from Puerta del Sol.